It was a word that seemed destined to become obsolete as its original meaning referred to the usually cross shaped slit in a wall designed for defense as it would enable the guardians of the building to fire arrows at any attackers while remaining protected by the wall itself. Once mankind had moved past crossbows for wreaking havoc on other human beings the original meaning of the term gradually faded from prominence. But it didn’t disappear entirely and in fact eventually took on an entirely new, and completely unrelated, meaning which is still prevalent today. A loophole now refers to finding a technically legal way around the intent of a law due to ambiguity in the way the law is written. There are tax loopholes, contractual loopholes and even coldblooded murder loopholes (so-called stand your ground laws), and as you’d expect they’re all widely exploited until some other law comes along to plug those holes up. One of the more frequently used loopholes over time involved ways around prohibition of alcohol consumption. Even after national prohibition ended in America with the passage of the Twenty-First Amendment in 1933 there remained many (mostly Southern) counties which outlawed booze for years after. Since people IN those counties were quite fond of booze they looked for one means or another to be able to do so without turning into an outright criminal. That’s when somebody invented Hadacol. A loophole which gave you the perfectly legal way to become a hapless drunk. Though the stated purpose of Spontaneous Lunacy is to present the history of rock ‘n’ roll in its entirety it’s natural that we also touch upon a broader cultural history in the process. It’d be almost impossible NOT to since music is one of the main forms of cultural expression society has – one that comments on the times at hand as well as which winds up shaping the cultural landscape of the future. In that spirit we’ve gotten into a wide array of relevant topics within many of the nearly five hundred song reviews that have made up rock’s first two years, among these are racial and generational splits in America of the late 1940’s, technological advances of that era which changed how music was made, marketed and heard, as well as what alternative forms of entertainment – IE. television – were appearing on the scene to vie for people’s attention as rock ‘n’ roll grew from an embryonic stage to a full grown entity. One thing however that has gone without mention, at least in an historically analytical way – is drinking. Oh, we’ve definitely talked about getting drunk, if only because so many of the songs themselves have used it as a plot device. We’ve even implied a character IN many songs was drinking when the lyrics didn’t make any mention of such an act. We’ve recommended having a belt at times, and cautioned against it at others. But what we haven’t done yet is talk in detail about something which many of the listeners to this music at the time were engaging in on a regular basis, often while they were listening to these records. Like it or not, drinking and music tend to go hand in hand, especially this kind of music. You don’t NEED one to enjoy the other by any means, but the two have always been paired together in one form or another, particularly since the proprietors of most clubs that featured musicians were hiring them to draw you in so you’d spend money at the bar. But with rock ‘n’ roll, a form of music that increasingly relied on the records themselves rather than club appearances to have it heard by the masses, the listeners had to create their own accompanying entertainment when you got together with a few buddies on a street corner or at a house party. All it takes is a bottle of wine, some girls to go along with the guys and plenty of music and you have yourself a made to order celebration. The same is true today. Underage kids – and those just past the legal drinking age – are the music’s main consumers and I’m sure the last party most of you went to that didn’t have alcohol was a birthday party when you were eight years old. So right around the time the music starts to become an important part of a kid’s life, the booze somehow finds its way into your hands as well. That brings us back to the historical segment of today’s review, specifically the creation of a legally available catch-all “remedy” cure to be able to slip through the loophole in so-called dry counties. Hadacol first appeared in 1943 devised by a Louisiana politician named Dudley LeBlanc, who like many politicians wasn’t averse to bending laws to line his own pockets. In this case LeBlanc took a supplement in elixir form that had fairly legitimate medical benefits, Vitamin B, and combined it with other vitamins, Iron and Niacin, making it sort of a catch-all multi-vitamin solution. But it wasn’t the vitamins that made it popular, it was the alcohol it was combined with as a “preservative”. 12% alcohol to be exact, making it roughly as potent as wine. Since this was being sold as “Patent Medicine”, albeit over the counter with no prescription needed, it enabled those in dry counties to get enough alcohol in them to give them a buzz. Furthermore it’d be hard to argue that it didn’t do what it claimed, which was to alleviate general aches and pains. The term “feeling no pain” to describe somebody who’s had a lot to drink may not have started with Hadacol, but it was a fitting description all the same… at least until the hangover hit. Or until you looked in your wallet and found it empty, for that was the other drawback to this magical elixir, its exorbinant cost. By the time this record we’re reviewing today came out in 1949 the price of 8 ounces of this miracle tonic was $1.25! For something not even 30 proof!!! Considering at the time you could get 100 aspirin for fifty-nine cents, which you’d surely need after ingesting too much of this stuff, you can see that it wasn’t the consumer who benefitted from this so-called medicine, but rather LeBlanc himself. The funny thing about it was Hadacol by all accounts tasted disgusting. It was a nasty smelling brown liquid that practically forced you to hold your breath as you drank it down. But then again, if it was curative powers for actual ailments you were after then it’s doubtful you’d have been buying Hadacol to ease your suffering in the first place. For nearly a decade LeBlac’s grand scheme worked, thanks in large part to his undeniable flair for self-promotion. Though he was a fraud as a health advocate he was a genius as an advertiser, as he used catchy slogans, full page ads, glowing testimonials and enough merchandise to rival Walt Disney and Superman. 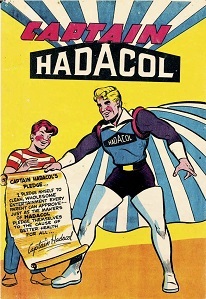 There was even a comic book touting the prowess of Captain Hadacol, not to mention children’s toys, almanacs and drinking glasses all featuring the distinctive Hadacol logo. There were also songs. Not just advertising jingles of his own creation but, because it was so widely popular throughout the South it became an oft-used topic for popular recordings as well. 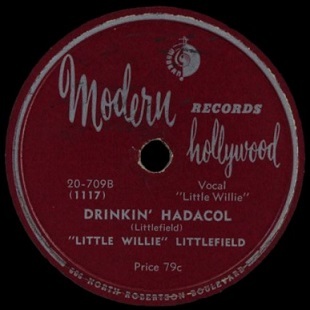 Among the most prominent was Little Willie Littlefield’s Drinkin’ Hadacol. Though I’m not quite sure what – if any – age restrictions there were for purchasing this swill, Littlefield, despite his youth, wasn’t fooled for a minute by its claims to be a health supplement. He knew the only reason anyone bought Hadacol was to get sloshed. The horns that introduce this are most definitely not what you expect. They’re not raunchy enough, nor powerful enough, to convince you of the potency of what’s to come. The slight whiff of an old school arrangement throws you off, almost as if it’s trying to deceive you into thinking this is relatively harmless stuff. Sort of like the ads for Hadacol itself made believe it was an all natural boost to your pep and vitality. In a way that misleading prelude makes the record oddly fitting for the subject because once the intro fades, just as once the consumer twists off the cap of the drink itself, the truth of what they both contain hits you between the eyes. Littlefield’s not hiding his intent any, his tongue is not planted firmly in his cheek nor is he delivering this with a wink and a nudge, probably because where he grew up in Houston there wasn’t any denying who consumed this and for what purpose. He’s mocking you is what he’s doing, as he makes clear with the very first line. So much for keeping it a secret or playing dumb. From there it’s mostly a series of examples of the lengths people go for this cheap high, claiming they’re even serving it at Carnagie Hall. I’m sure Dudley LeBlanc was reveling in this free advertising especially once Littlefield’s piano and the cracking drums take center stage with the vocal lines seeming half ad-libbed, or at the very least secondary to the buzzy vibe the music – including a leeringly drunken sax solo – creates. Drinkin’ Hadacol is undoubtedly a better record than a song, as there’s really not much to this beyond a few grins at the audacity of the commentary he spews forth. 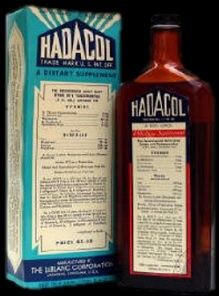 But then again Hadacol itself is better hooch than medicine so I suppose it evens out in the end. But neither is first rate by any means. Just as you’d much rather have a bonded whiskey or at the very least some cheap bottled wine than this fourth rate sewer water, you’d rather have a better crafted song, one with a more coherent storyline, a tighter arrangement and an actual chorus somewhere along the line. But both the drink and the record will give you enough of a buzz to suffice if that’s all you have to get you through the night and since this was a B-side anyway, there are far worse things for Modern Records to have slapped on the single – such as an attempt to cross Littlefield over into classier joints with a pop ballad – that we can’t be too critical of something this unabashedly tactless. Obviously this wasn’t going to be what Little Willie Littlefield was going to build his career on, though it WAS a regional hit in many places even though it wouldn’t wind up being more than a footnote in his legacy, but the same can’t be said for Dudley LeBlanc. Hadacol may have been reaping some serious money, enough so that he was able to bring major radio and recording stars to Louisiana to perform in his traveling medicine shows to promote this stuff, but with his extravagant advertising expenses he was actually losing more money than he made, even though he made a lot. 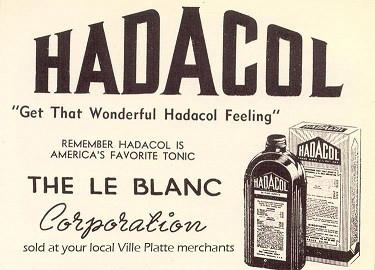 As government agencies were breathing down his neck and with increased scrutiny of Hadacol’s contents in the media, plus a trend towards more liberal alcohol laws which meant increasingly in counties throughout the South you could begin to buy the real deal, not this backwash masquerading as medicine, LeBlanc sold his stake in his creation in 1953. The new buyers were startled to learn of the company’s financial precariousness and in short order it faded from sight altogether… though it never fully left the public’s consciousness. In spite of its short lifespan, Hadacol remains at least topically familiar into the Twenty-First Century, which may be thanks to an abundance of songs such as Littlefield’s, though Drinkin’ Hadacol itself is long forgotten. Or it could be that its legend persists simply because it was such a colorful example of somebody finding a loophole to “get away” with something right under everybody’s nose. The fact LeBlanc was such a huckster certainly didn’t hurt and in the end any time a punchline is memorable for three quarters of a century people are sure to recall the joke that launched it. Why’d you call it Hadacol? Leave a reply on "Little Willie Littlefield: “Drinkin’ Hadacol”"